This figure shows a standard billing process. In this diagram, the customer calls customer care or works with an activation agent to establish a new wireless account. the agent (customer care) enters the customer's service preferences into the system, checks for credit worthiness, and provides the customer with a phone number so that the customer may make and receive calls through the telephone network. 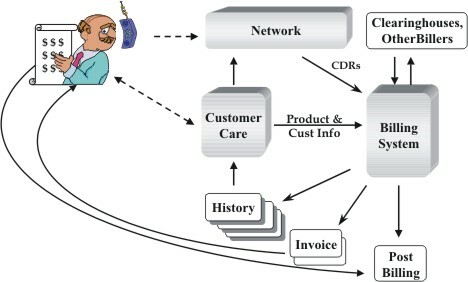 As the customer makes calls, the connections made by the network (such as switches) create records of their activities. These records include the identification of the customer and other relevant information that are passed onto the billing system. The billing system also receives records from other carriers (such as a long distance service provider, or a roaming partner). The billing system now guides and updates these call detail records (CDRs) to their correct customer and rating information. As information about the customer is discovered (e.g. rate plan), the updated billing records are placed in a billing pool so that they may be combined into a single invoice that is sent to the customer. The customer then sends his payment to the telecom service provider. Payments are recorded in the billing system. History files are then updated for the use of customer service representatives (csrs) and auditing managers. This figure shows the basic structure of a call detail record (CDR). This diagram shows that a usage data report (UDR) contains a unique identification number, the originator of the call, the called number, the start and end time of the call. this diagram also shows an additional charge for operator assistance and that a UDR dynamically grows as more relevant information becomes available. Avi Ofrane founded the The Billing College in 1996, a training company addressing the converging market trends associated with telecommunications billing and customer care. The Billing College is a spin-off company of Mr. Ofrane's technology consulting company, Jupiter data, inc., established in 1990. Mr. Ofrane began his career in 1977 as an analyst with the IBM corporation and has since 1982 concentrated exclusively on the telecommunications industry, in which he is now a recognized expert in billing and customer care. throughout his extensive career, Mr. Ofrane has been involved in all aspects of the industry, from strategic planning and executive management to vendor evaluation and project implementation. Mr. Ofrane lectures extensively on billing and customer care issues, strategies, methodologies, and practices. he is a frequently requested speaker at major north American and European conferences. Mr. Ofrane is currently president and CEO of The Billing College, as well as a master instructor of the company's courses. Mr. Ofrane is the co-author of the book "telecom made simple" and has written numerous articles for international trade publications. Mr. Ofrane holds a bachelor of science in computer science from pennsylvania state university. Mr. Lawrence Harte is the president of Althos, an expert information provider covering the communications industry. He has over 29 years of technology analysis, development, implementation, and business management experience. Mr. Harte has worked for leading companies including Ericsson/General Electric, Audiovox/Toshiba and Westinghouse and consulted for hundreds of other companies. Mr. Harte continually researches, analyzes, and tests new communication technologies, applications, and services. He has authored over 80 books on telecommunications technologies on topics including IPTV, wireless mobile, data communications, VOIP, broadband, prepaid services, and communications billing. Mr. Harte holds many degrees and certificates include an executive MBA from Wake Forest University (1995) and a bset from the university of the state of new york, (1990). Mr. harte can be contacted at lharte@tvdictionary.com. Billing and customer care (BCC) systems convert the bits and bytes of digital information within a network into the money that will be received by the service provider. to accomplish this, these systems provide account activation and tracking, service feature selection, selection of billing rates for specific calls, invoice creation, payment entry and management of communication with the customer. This book is excerpted from the telecom made simple book provides the fundamentals for billing and customer service systems. the topics that are explained include: types of services, standard billing processes, real time billing, multilingual support, multiple currencies, inter-carrier settlements, event sources and tracking, mediation devices, call detail records (CDRs), call processing, cycle billing, clearinghouse, invoicing, management reporting, processing payments, and posting to the financial system. also included are the fundamentals of customer relationship management (CRM), account activation, account management, billing system costs, call center, collections, exchange message record (EMR), automatic message accounting (AMA), carrier inter-exchange billing exchange record (Ciber), transferred accounting process (tap), network data management-usage (ndm-u), interim standard 124 (is-124), applications service providers (asps), local number portability (LNP), and customer self-care.